This entry was posted in aids to navigation, Budget, Caribbean, Disaster Relief / Humanitarian Assistance, Gulf Coast by Chuck Hill. Bookmark the permalink. 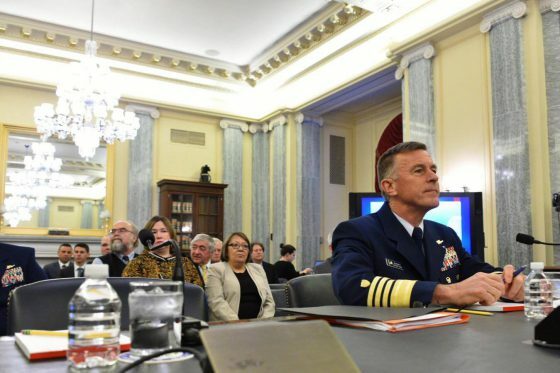 “History has proven that a responsive, capable, and agile Coast Guard is an indispensable instrument of national security.” And what history is that? One of the problems with recognition, the Coast Guard does not support or promote its history. No history. No being. It is a bit inevitable in that our budget is smaller. We have fewer CG veterans compared to the other armed services. We do have the advantage of being more geographically spread around, so there is lots of local news about the Coast Guard. Frankly in some ways I think we have gotten disproportionate publicity, but most of it is “good news” that does not really help our budget fight, like rescuing sea turtles. I think the Commandant had been staying on messages and hitting the same points from the beginning of his term and it seems to be making an impression. True the local news for sea turtles or picking a boater in distress off their vessel in conditions no sane person should be out in don’t translate to a better budget. It’s funny. I was reading an editorial making some recommendations for the Navy post-4 collisions in 7th Fleet this year, and one of the main points is that the Navy is loosing skills do to becoming a multi-mission force. (I presume they were refering to the expansion of the expeditionary branch of the Navy.) I couldn’t help but think to myself: “Try 11 mission areas with a MUCH smaller force and budget, bub…” Now, other than criticizing that one point of his, I think if he can call that aspect of “multi-mission distraction” out as an operational issue for USN, the USCG certainly can for Homeland Security. I still think Environmental Response and Icebreaking should be transferred to NOAA, and ATON to USACoE. All the other missions are LE/Homeland Security/National Defense, except SAR, which is close to LE. That wouldstreamline mindset, missions, and assets. Given that “the wall” will inevitably increase maritime border protection needs, and the “make-do/barely get-by” austere budget the CG has always been plagued by, keeping the budget amount where it’s at, while reducing missions and aged assets, would allow for some revitalization for a few years until the wall increases the optempo. “$19 million to support Polar Icebreaker acquisition”. Please tell me that is for R&D? I hope they are looking at EXISTING designs to baseline on? Do you know how much of the $19 mil goes to the Navy i.e. NAVSEA I suspect? One has to ask oneself: WHY are we spending so much on so few icebreakers? analogous to the Navy’s DDG-1000 program?